We estimate that confectionery only constitutes about 10% of Kraft's total revenues; all of that chocolate. Strategically, therefore, why buy the full-range confectionery giant Cadbury ? The main rationale seems to be to enter a higher margins business; a sort of 'one-shot solution' to Kraft's profitability problems. We think a more strategically sensible move would be for Kraft to acquire Sara Lee instead; a consolidation rather than a diversification move; strong parallels with the Premier - RHM merger; much cheaper also. Kraft and Cadbury are in different businesses ...Cadbury is now a 'pure-play' confectionery company. It's FY2008 revenue, of US$ 10 bln equivalent, is divided roughly 45% chocolate, 35% gum and 20% candy. Meanwhile, snacks in total constitute 40% of Kraft's FY2008 revenue of US$ 40 bln. We estimate about half of that to be biscuits, and another third salty snacks. That leaves chocolate at 10% of global turnover (brands like Milka, Marabou and Cote d'Or). It has no significant candy or gum brands, having sold its sugar confectionery business to Wrigley in 2004. So in rough numbers, Kraft would treble its confectionery business, and go back into gums and candies in a big way. Wouldn't it be wiser for Kraft to focus its acquisition strategy on its main existing businesses ? ... with Kraft's bid driven by margin not strategic rationaleKraft has justified its bid for Cadbury on the basis, inter alia, of gaining higher margins and a greater presence in 'instant consumption' channels. Whilst this is understandable, from a short-term point of view, we believe Kraft should prioritise sustainable competitive advantage in its existing categories, even if that means hard work to eradicate overlaps and extract synergies. Sara Lee is a better target for Kraft ...In that respect, we believe that Sara Lee provides a far better fit for Kraft, than Cadbury does. It could also be a much better value acquisition, given Sara Lee's continued difficulties. ... with potential in bakery ex -breads ...Sara Lee's north American and international bakery businesses contributed about US$ 3 bln to Sara Lee's turnover in FY2009. It's true that this is weighted in fresh bread, which Kraft seeks to avoid. However, it also includes value -added patisserie and cake ranges. There are also strong brands here, like Sara Lee itself or Bimbo in Iberia, which can be stretched into higher -margin products. ... plus overlap in grocery and meals ...Moreover Sara Lee's retail and foodservice businesses, have significant overlap with Kraft's grocery and convenience food divisions, and delivered USD 5 bln in sales in FY2009. Again, meats may not be ideal for Kraft, but the synergy and brand stretching potential there is major. ... and development opportunities in beveragesIn coffee, through Douwe Egberts, Sara Lee provides Kraft a huge opportunity to expand beyond its Maxwell House and Jacobs brands. DE is the second largest coffee roaster in the world, has a strong pipeline of value-added innovations, and has global reach covering Europe, Brazil, Russia and Asia. Beverages provide 20% of Kraft's total revenues, and Douwe Egberts would add another US$ 3 bln to that. Sara Lee's non -foods unit to be divestedIn fact the only division in Sara Lee that doesn't overlap with, or add value to Kraft, is its personal and homecare business; that's anyway in the process of being divested by the group. For the same impact on the top -line ...In aggregate, therefore, Sara Lee would bring a total of US$ 10 bln of additional revenue to Kraft. That's roughly the same as Cadbury would. ... consolidation makes more sense than diversificationThe difference is that Sara Lee brings scale, consolidation and cost synergies, in bakery and grocery and convenience food, plus a step change for Kraft's beverages business. Cadbury on the other hand brings almost a whole new business, confectionery, for Kraft to manage, on top of its existing vast portfolio. 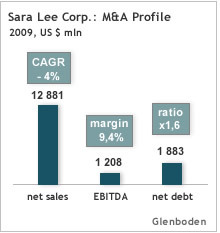 Sara Lee would also be less risky in valuation termsThen there's the valuation story. Cadbury is clearly meeting its target of being a successful stand -alone entity, under its Vision into Action plan. It's top-line is growing in the 5 -10% range p.a. ; the EBITDA margin is in the mid -teens; the group's M&A strategy is exemplary - 'out with the bad and in with the good'. Kraft would have to pay top -dollar for such a company. Its initial, rejected offer may look reasonable (see valuation), but it would look very high if one used Cadbury's reported rather than underlying EBITDA for FY2008 (nearly x20 multiple). How high will they have to go ? Sara Lee, on the other hand, is in decline in revenue terms (see profile), and has an EBITDA margin which, especially after stripping out its non -food division, is well below 10%. Its valuation might be only 50% of that of Cadbury. Strong parallels with the Premier - RHM dealThe acquisition of Sara Lee by Kraft would have the same logic as the merger of Premier Foods and RHM, in the UK, in 2007. Consolidating dry foods categories, bolt-on ranges, building on strong brands, improving service to the retail trade. The difference being that Kraft might not have to overpay.